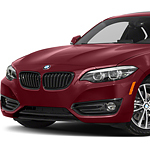 What is the Ride Like in the BMW 2 Series? While heads turn when a BMW 2 Series vehicle passes, the appearance and sound of the car do not tell of the ride provided. Since the BMW 2 Series is considered an executive vehicle, you would think that the ride would be as smooth and effortless as any other luxury vehicle despite its compact size, and you would be correct. The BMW 2 Series rides comfortably with all four wheels having independent suspension so that any bumps are isolated to the specific wheel. The frame is supported by an electronic leveling program to minimize roll when taking corners in Medford quickly. Sound dampening is so effective that the engine noise is more of a feel than a sound. The BMW 2 Series is an impressive vehicle inside and out, and the certified technicians at Medford BMW know how to keep it that way.